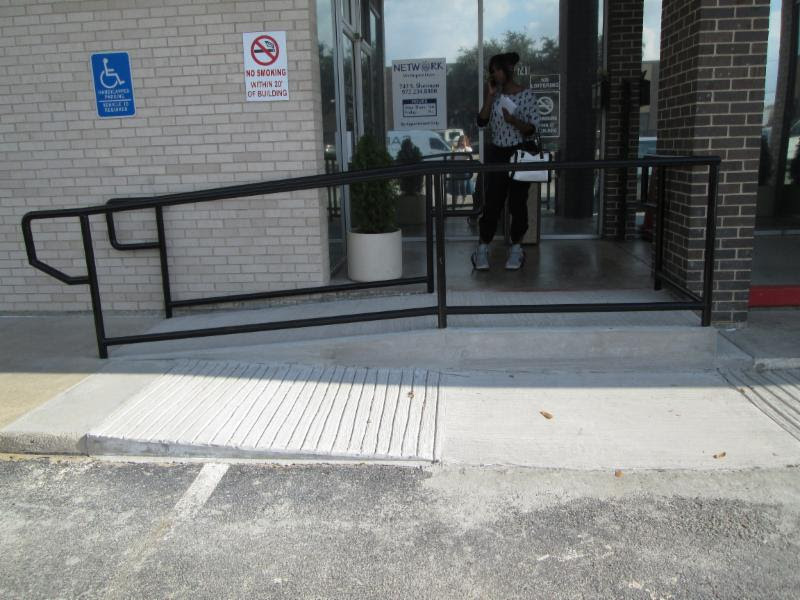 Detectable warnings are only required at curb ramps located in the public right of way and platform boarding edges. 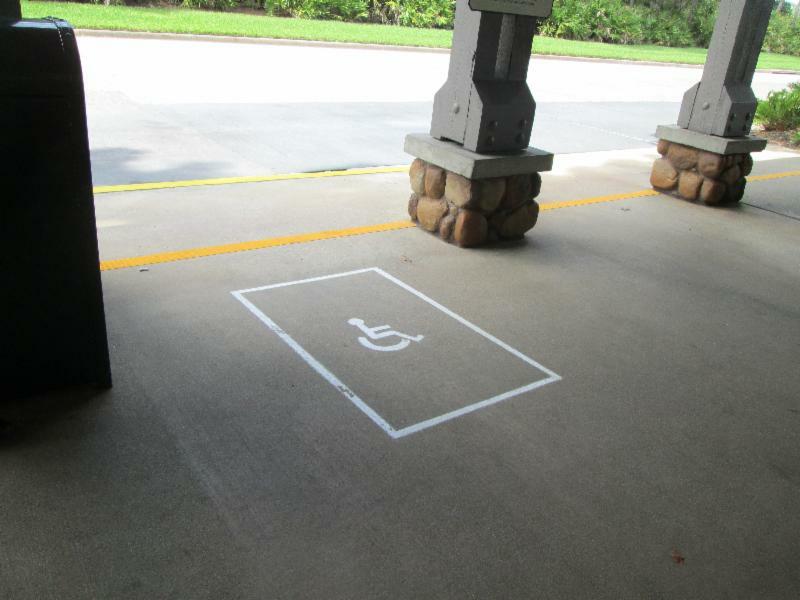 Detectable warnings are used to assist persons that are visually impaired in detecting hazards along their wayfinding. 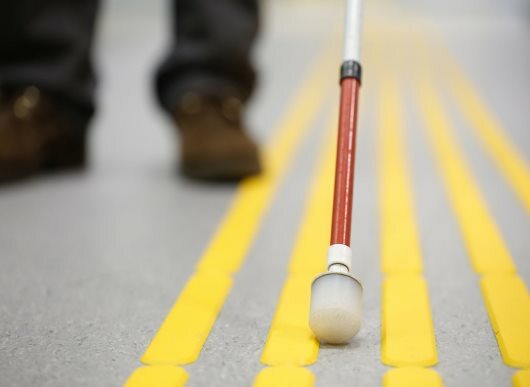 A person who is visually impaired uses a sense of touch to find their way. Detectable warnings is one of those methods. 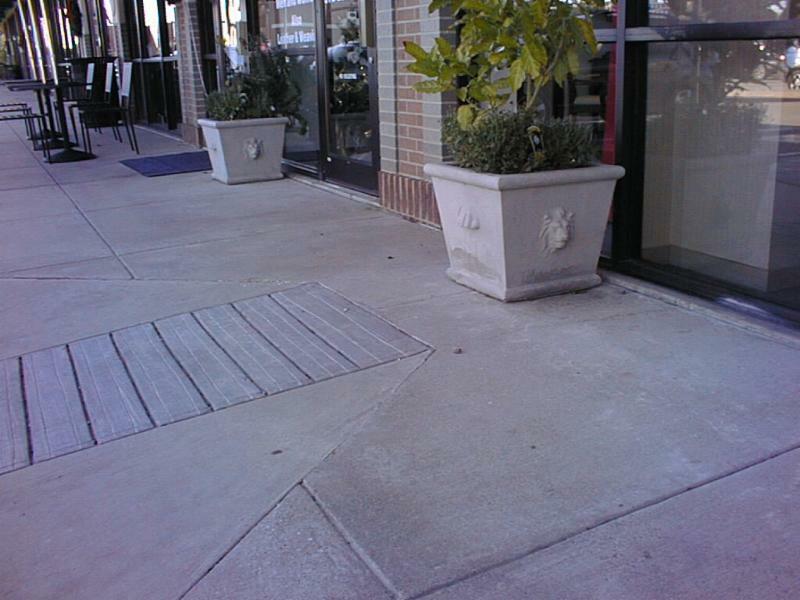 In the 1991 ADAAG, detectable warnings were described as having contrasting color and texture. Contrasting color meant that it should have a different color than its surroundings (either light to dark or dark to light) and texture was achieved by using truncated domes. 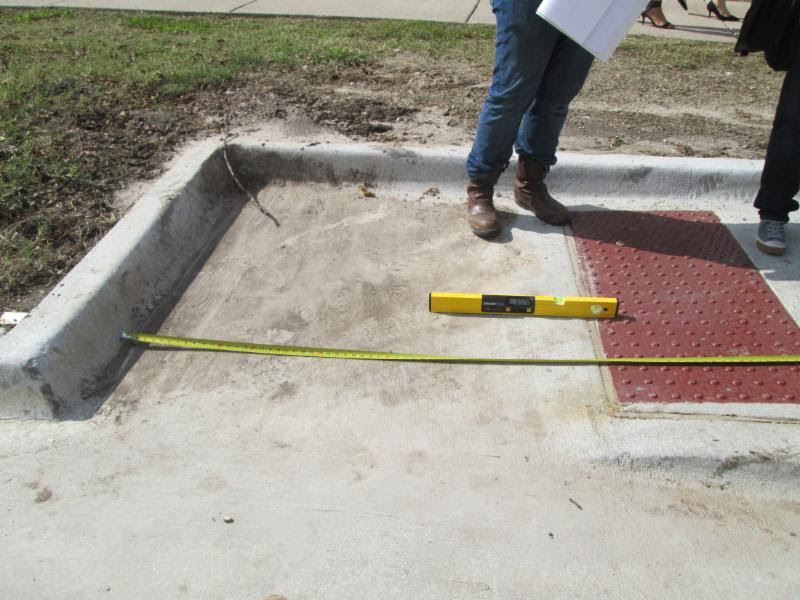 They were required at curb ramps and the edges between pedestrian and vehicular ways. 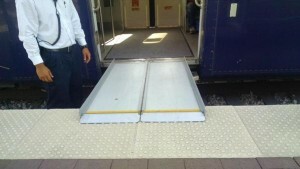 But in the 2010 ADA Standards they were limited to only platform boarding edges. 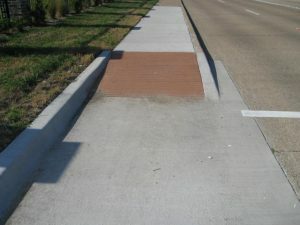 The Public Right of Way Accessible Guidelines (PROWAG) and the 2012 Texas Accessibility Standards (TAS) also requires detectable warnings at curb ramps located within the public right of way. 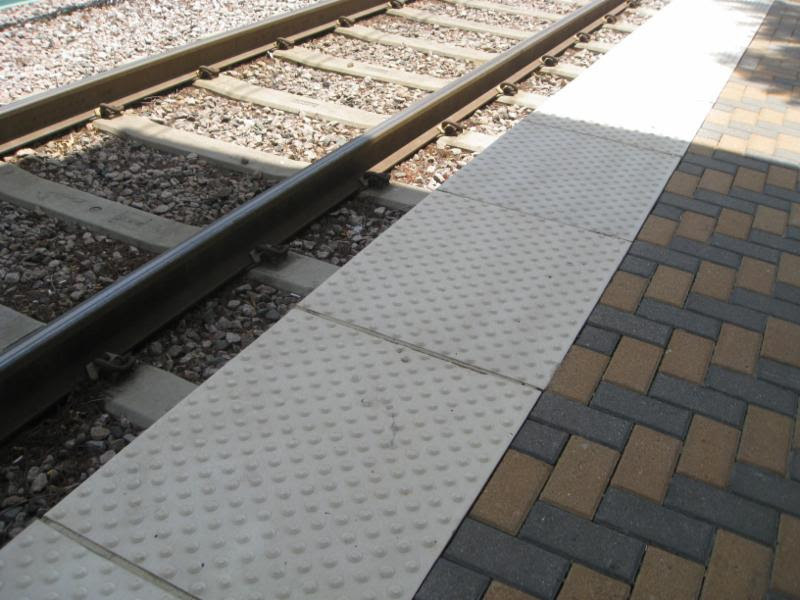 The ADA standards requires that detectable warnings be located along the boarding edges of trains or bus platforms. 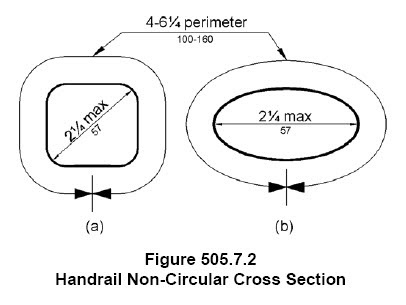 ADA 705.2 (train) Platform Edges. Detectable warning surfaces at platform boarding edges shall be 24 inches (610 mm) wide and shall extend the full length of the public use areas of the platform. ADA 810.5.2 (Bus) Detectable Warnings. Platform boarding edges not protected by platform screens or guards shall have detectable warnings complying with 705 along the full length of the public use area of the platform. There are also requirements for public rights of way (located outside the property line). 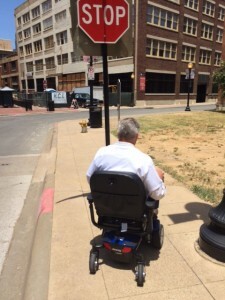 The federal standards are called the “Public Right of Way Accessibility Guidelines” (PROWAG). These are still a draft and have not been adopted, although they are recommended. 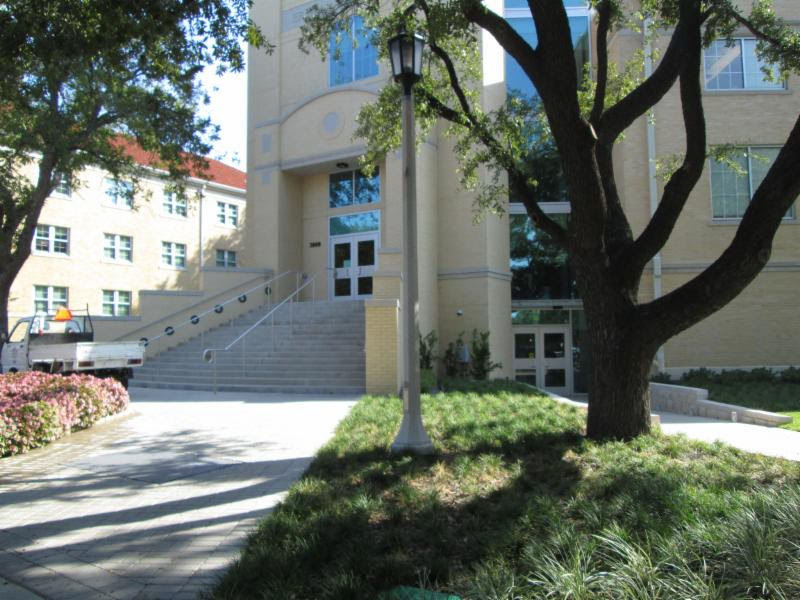 In Texas, TDLR wrote in their administrative rules a set of guidelines for public rights of way. Below is a brief summary of each. 5. 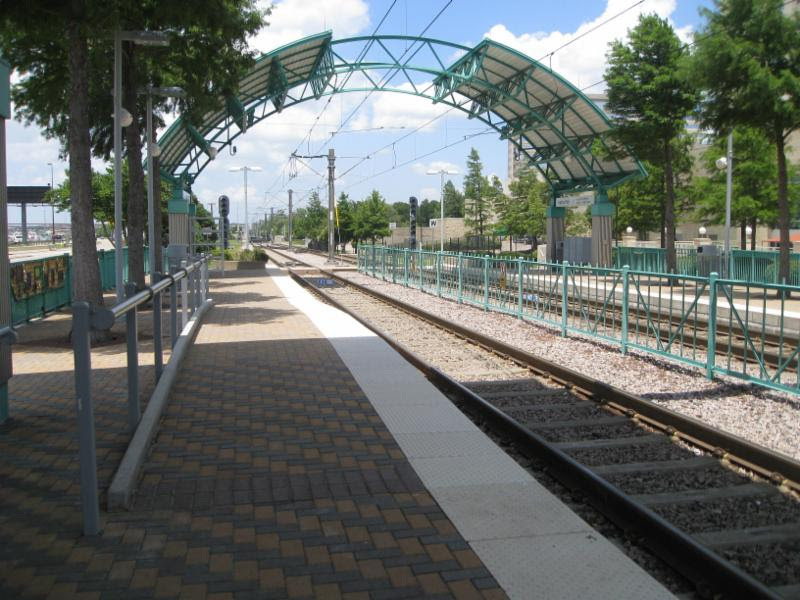 Boarding and alighting areas at sidewalk or street level transit stops for rail vehicles where the side of the boarding and alighting areas facing the rail vehicles is not protected by screens or guards. the full width of the ramp run (excluding any flared sides), blended transition or turning space. 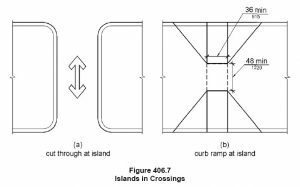 – At pedestrian at-grade rail crossings not located within a street or highway, detectable warnings shall extend the full width of the crossing. – At boarding platforms for buses and rail vehicles, detectable warning surfaces shall extend the full length of the public use areas of the platform. 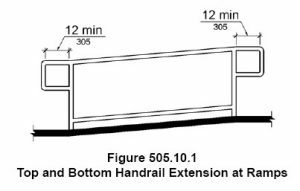 – At boarding and alighting areas at sidewalk or street level transit stops for rail vehicles, detectable warning surfaces shall extend the full length of the transit stop. 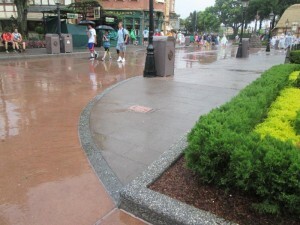 flush transition between the street and the sidewalk. 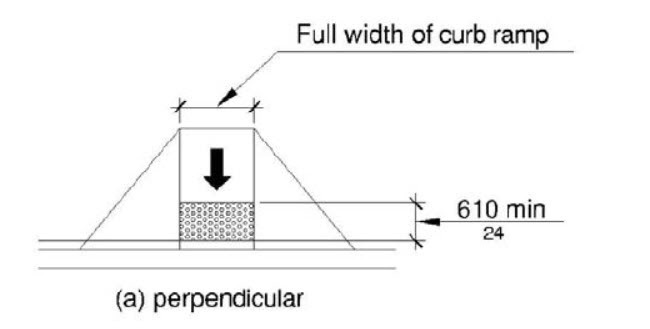 (A) At perpendicular curb ramps constructed within the public right of way, detectable warnings complying with TAS 705 at a minimum of 24″ in depth (in the direction of pedestrian travel) and extending the full width of the curb ramp shall be provided where the pedestrian access route enters a crosswalk or other hazardous vehicular area. 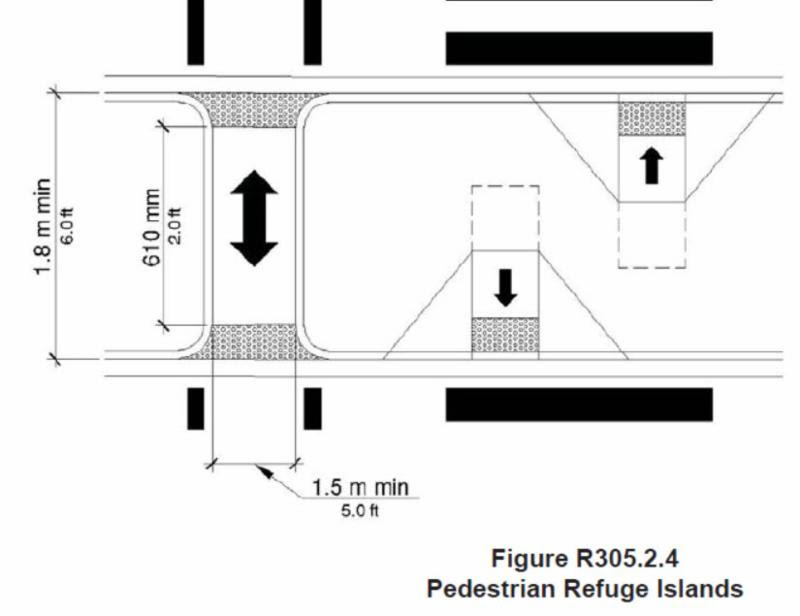 (B) At parallel curb ramps constructed within the public right-of-way, detectable warnings complying with TAS 705 at a minimum of 24″ in depth (in the direction of pedestrian travel) and extending the full width of the landing shall be provided where the pedestrian access route enters a crosswalk or other hazardous vehicular area. 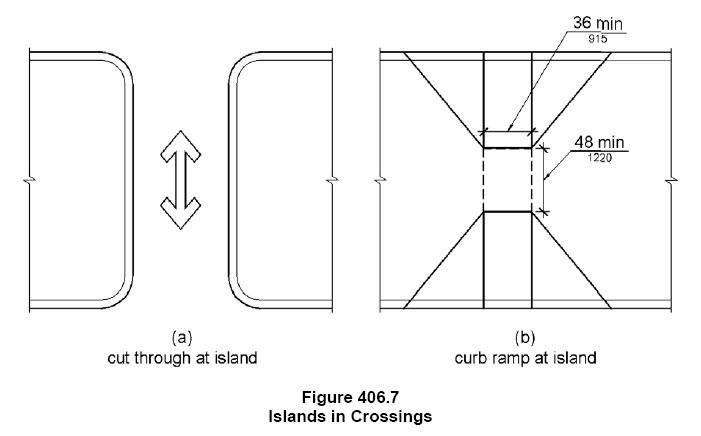 (C) At diagonal curb ramps constructed within the public right-of-way, detectable warnings complying with TAS 705 at a minimum of 24″ in depth (in the direction of pedestrian travel) and extending the full width of the curb ramp or landing, shall be provided where the pedestrian access route enters a crosswalk or other hazardous vehicular area. 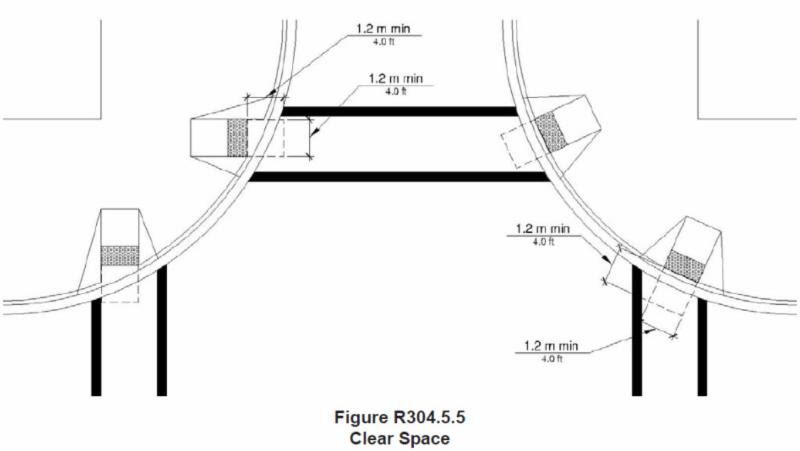 Additionally, the department will allow the detectable warning to be curved with the radius of the corner. 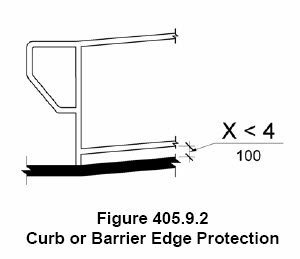 The detectable warning shall be located so that the edge nearest the curb line is 6″ minimum and 10″ maximum from the curb line. If you do work in Texas you should be aware that there is a new system for online registration and keeping track of the projects. The Texas Department of Licensing and Regulation has now created a system that eliminates most paper forms and makes many things cloud-based. 2) The TDLR registration occurs in the pull-down menu shown below. You can also fill out the registration form and send it to your RAS for her to do it for you. 4) when you register the project (or fill out the registration form), you will also be required to submit the square footage of the building. If it is not a building, make your best faith effort to estimate it. 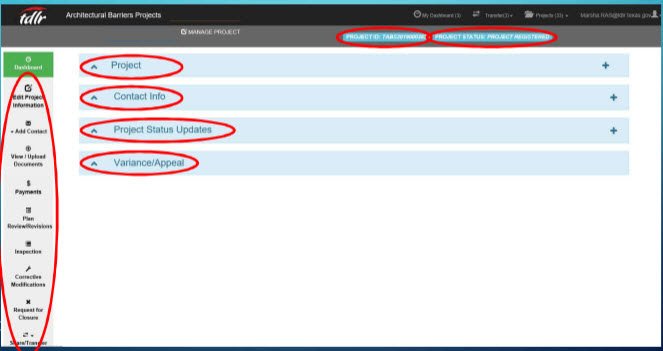 In this new system you will be able to update information to the project, upload revised drawings, and check the status of the project. If you have any questions about this new system you can reach our office or TDLR directly. 4. 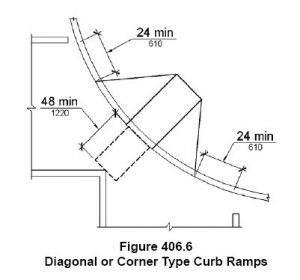 Both ramps and curb ramps require a minimum clear width of 36″ (per 405.5). 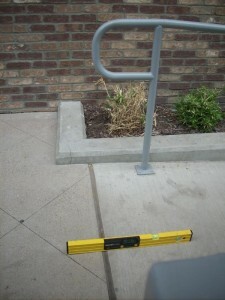 The width is measured inside the handrails if they are provided. Those are the only requirements that they share. 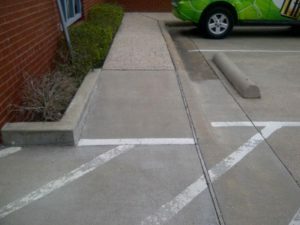 There are other requirements that only apply to Ramps and some that only apply to Curb Ramps. 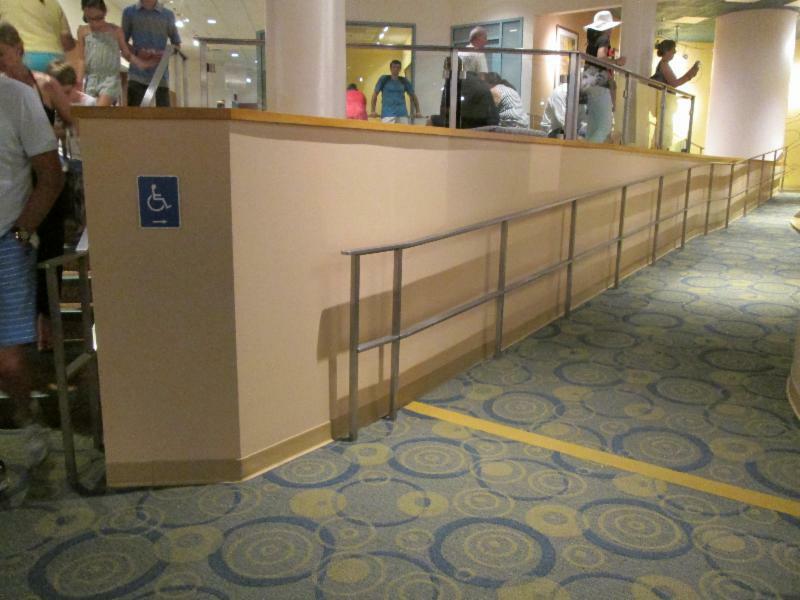 3) Only a ramp ramp requires handrails on both sides (except if the rise is less than 6″). 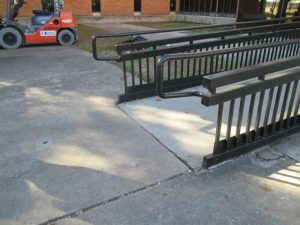 4) Only a ramp requires edge protection if there is a drop off on either side of the ramp. 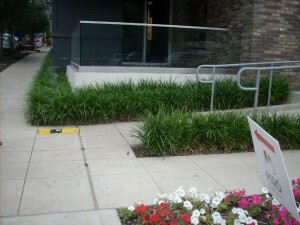 So even if a curb ramp is higher than 6″ in vertical rise, it will not require handrails. 1. Only a curb ramp requires that the bottom of the ramp have a slope no steeper than 1:20. 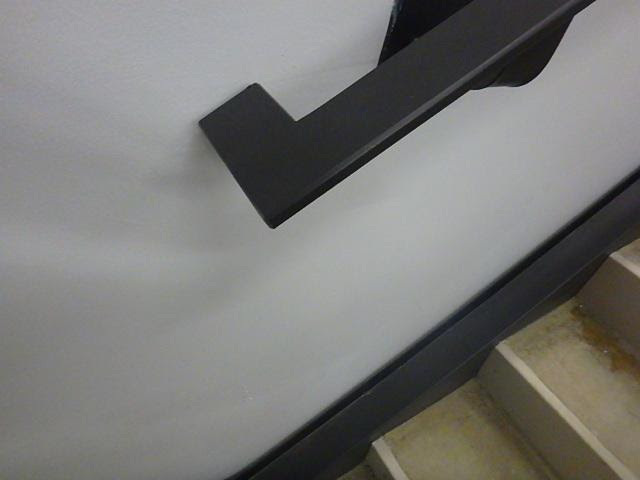 This is called a counter slope. (Per section 406.2). 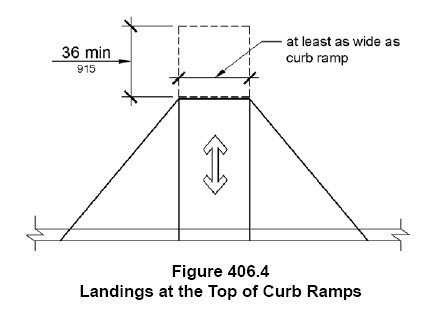 A regular ramp will require a landing at the bottom with a slope no steeper than 1:48 in all directions. Flare sides are recommended if the curb ramp is located within a path of travel. This would prevent any tripping. 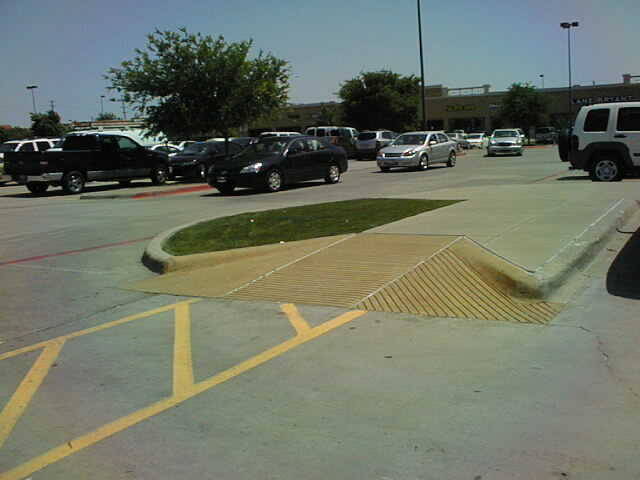 Since the flared sides are not “required” a parallel curb ramp is allowed to be used. If you are wondering why we haven’t mentioned detectable warnings (i.e. 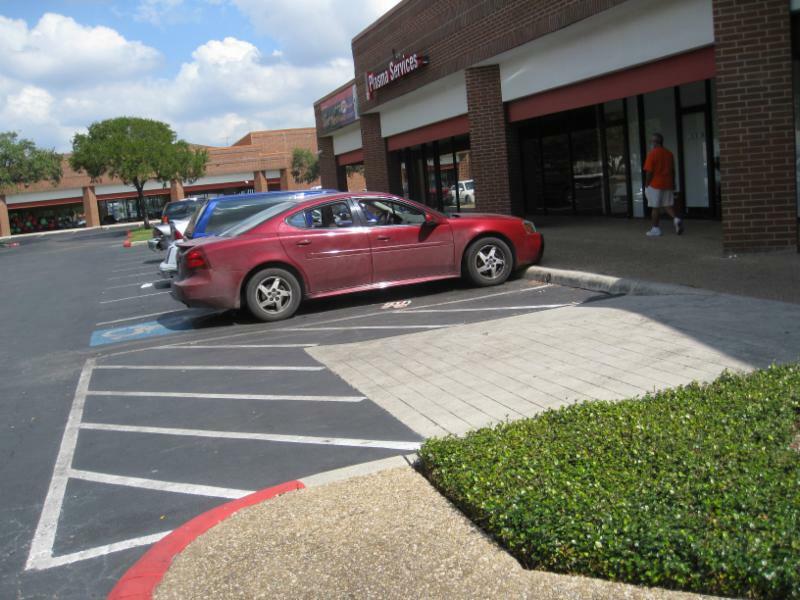 contrasting color and texture/truncated domes), it is because curb ramps do not require them anymore. Some Departments of Transportation in different States have adopted a Public Right of Way Guidelines that give us a scoping for when the detectable warnings are required. 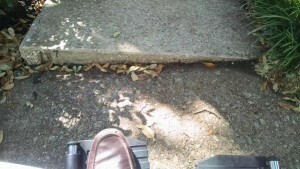 Basically any curb ramp located inside the property line will not require detectable warnings. 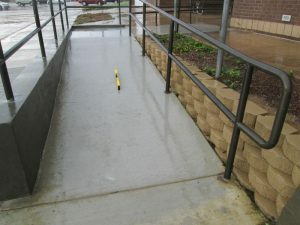 Any curb ramp that is located in the public right of way will require a portion of the ramp to have detectable warnings. The bottom 24″ of the curb ramp must have the truncated domes and the contrasting color. 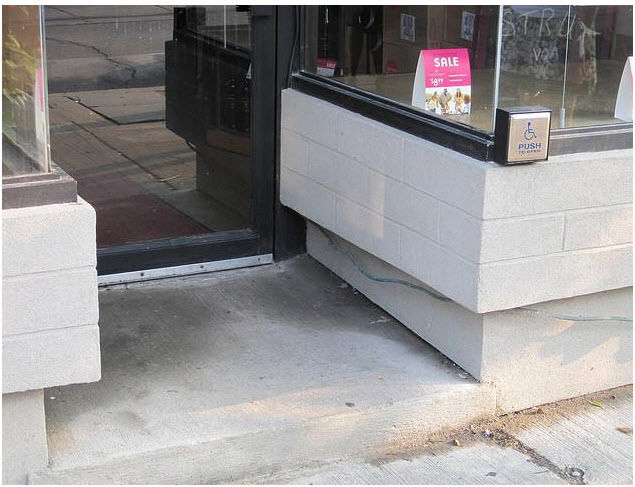 Check your municipality on what they have adopted to see if their curb ramps need it. Abadi Accessibility will be donating 5% of the fees received in the month of September to help the victims of hurricaine Harvey. Thank you for your assistance! 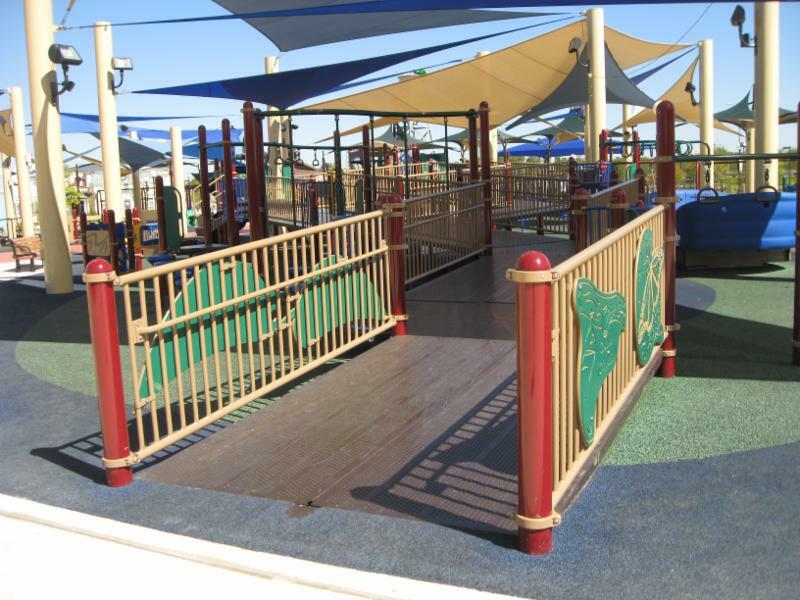 Elevated play components: A playground equipment that is accessed above the grounds. 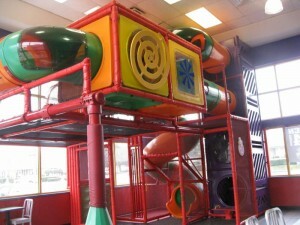 Some examples of elevated play components are slides and monkey bars. 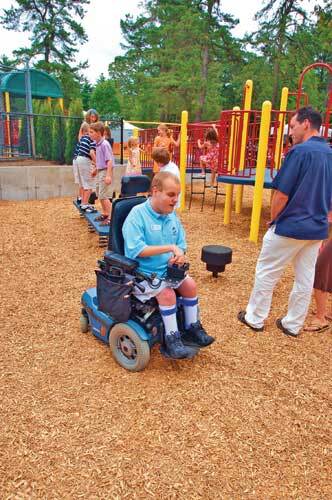 the accessible route: An uninterrupted path of travel that connects the entry and exit of play components. A 60″ wide accessible route must be provided. 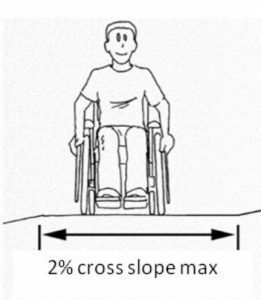 The running slope should be no steeper than 1:16 and the cross slope no steeper than 1:48. 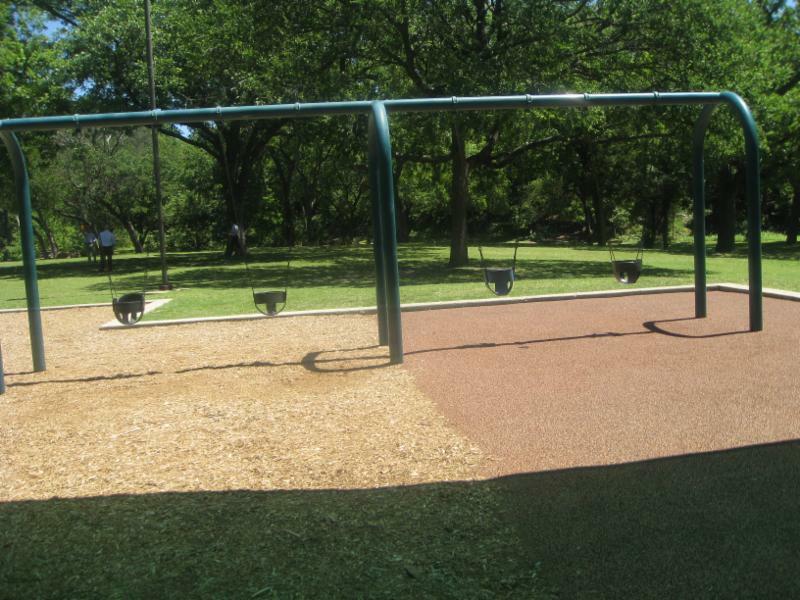 Use zones: The ground level area beneath and immediately adjacent to a play structure or play equipment that is used for circulation around the play equipment and where it is predicted that a user would land when falling from or exiting the play equipment. 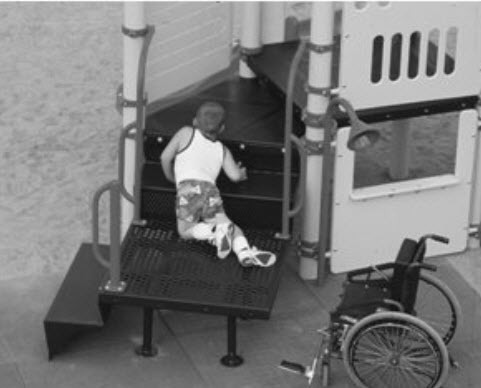 The number of play components that must be on an accessible route is determined by how many “elevated components” are provided. 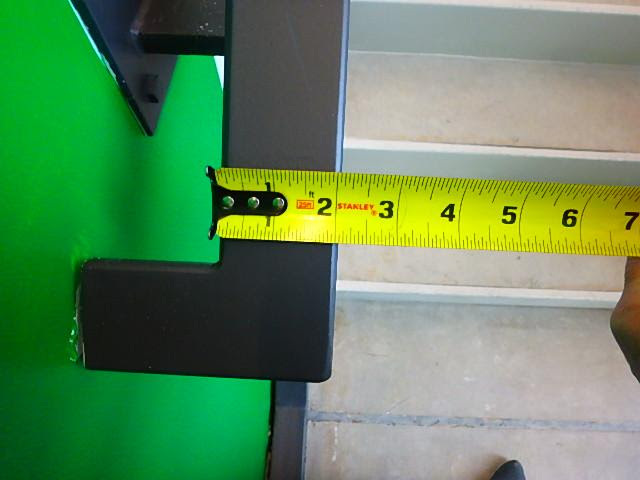 There is a table in the ADA that we use to determine that number. 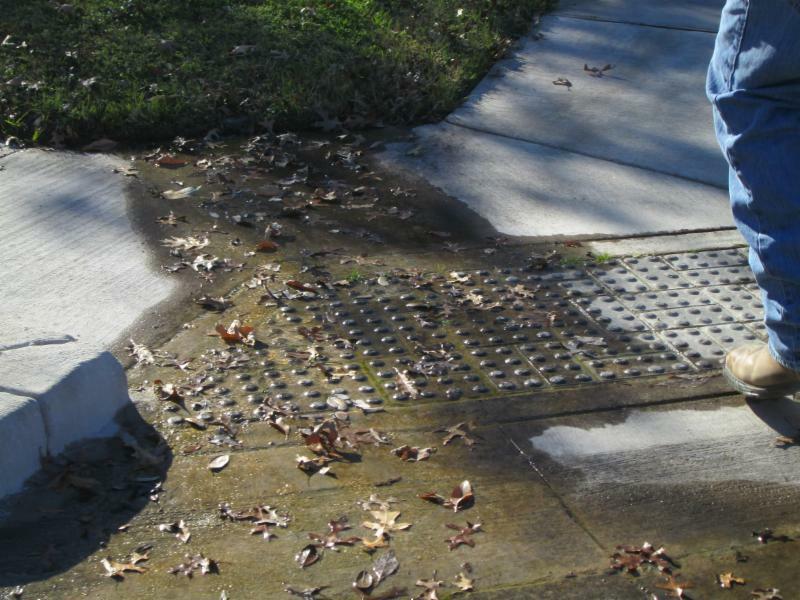 But a minimum of one of each type of ground level component should be provided. 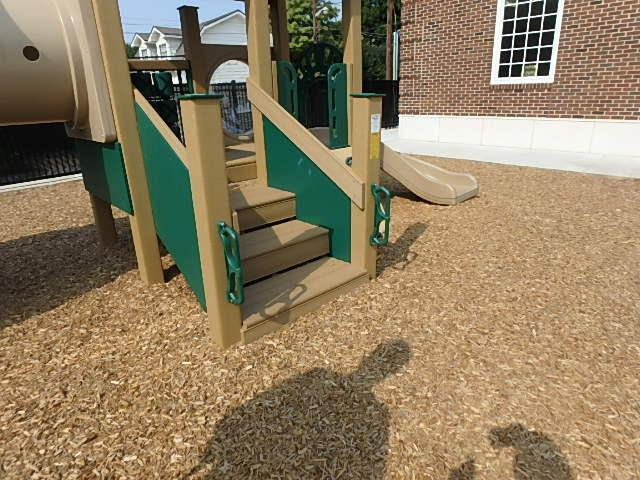 Swing sets are also ground level play components. 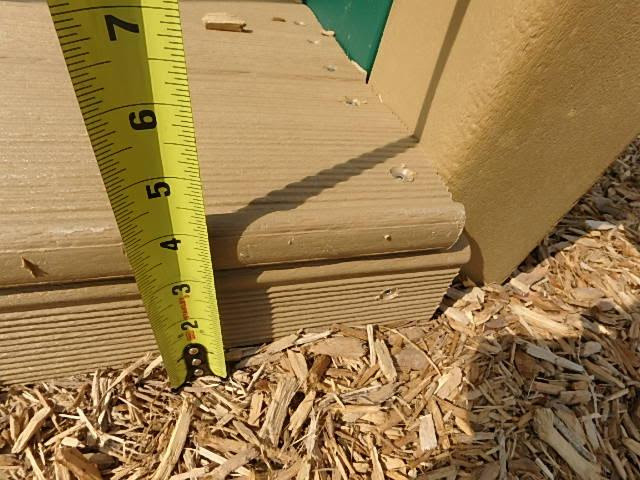 This picture shows a ground surface that is more stable, but wood chips are also acceptable. 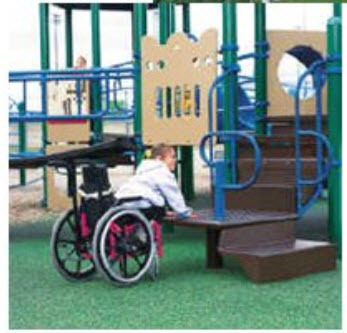 For elevated play components 50% must have either a ramp or a transfer system to access them and be on an accessible route. 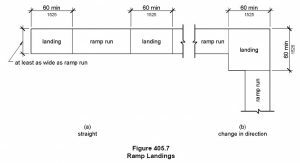 Ramp runs should have a running slope no steeper than 1:16 and the rise of any ramp shall be no more than 12″ and, where required, handrails must also be provided. 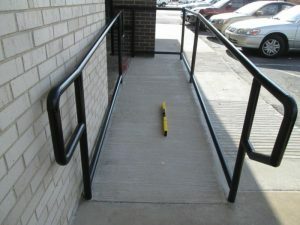 Handrails at these ramps do not require an extension at the top and bottom. 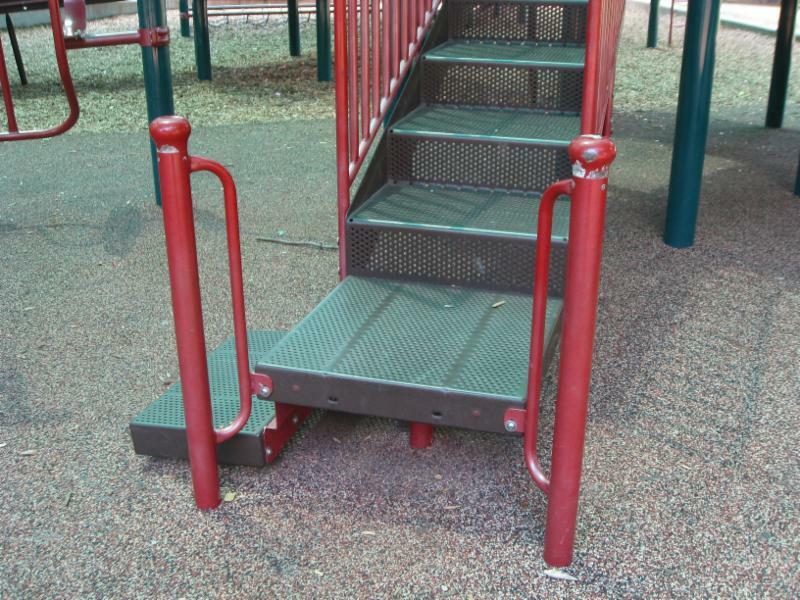 This ramp connects elevated play components. 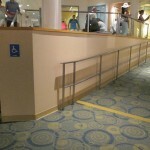 The handrail provided must be between 20″-28″ a.f.f. 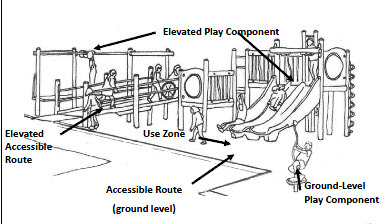 Besides the accessible route and play components, use zones must be provided adjacent or below the playground equipment. 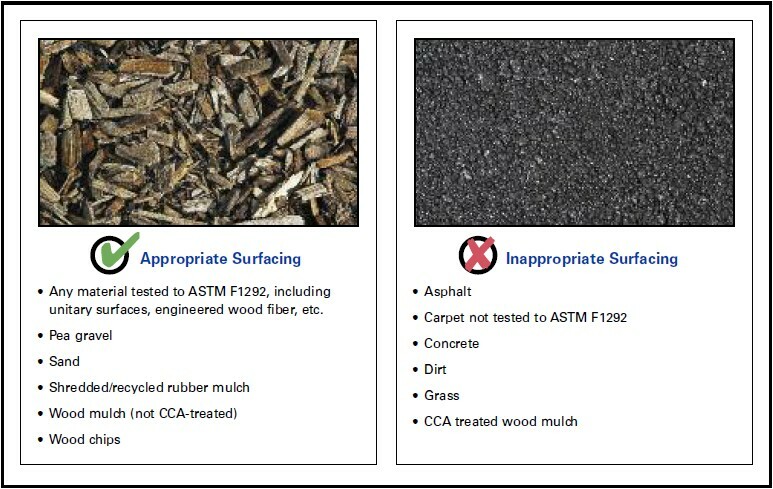 They should have a ground surface that complies with ASTM F1292 (1999 or 2004 edition). 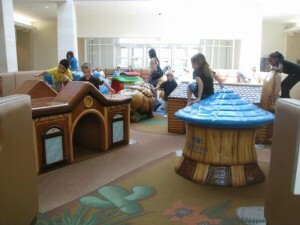 The play structures and play areas that are located in restaurants and shopping centers must also be accessible. 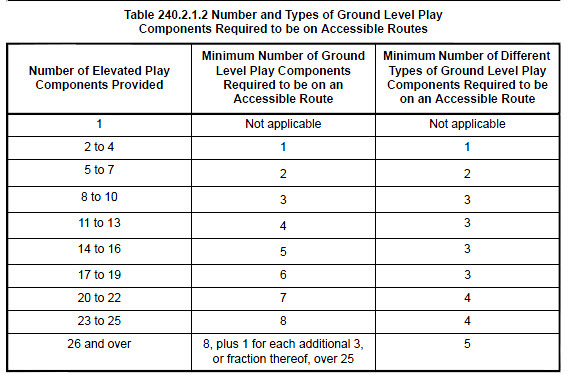 Accessible routes connecting the different play components must be provided. 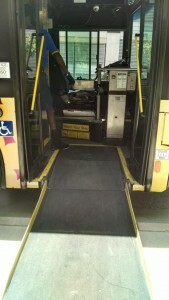 A transfer system is the most common means of access. 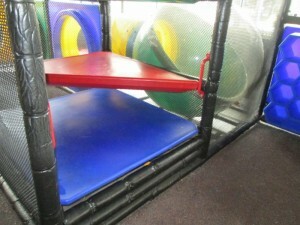 This play structure does not have the required transfer system. 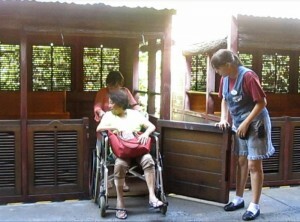 A child with disabilities would not be able to enter the structure. 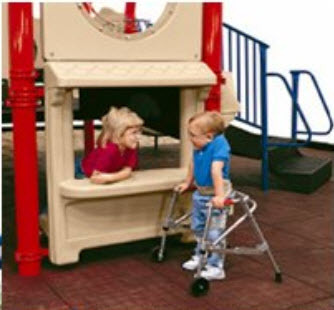 The play components in this play area are considered ground level components and only require an accessible route to the entrance and exit of the component. If there are any operable elements, they should be within reach range. My family and I just finished our first vacation to Disney World! We had such an incredible time riding all the rides, eating all the junk food and navigating our way around the various theme parks. My children did have to endure a few embarrassing “mom” moments, however — more than most kids usually have to put up with on a family vacation. 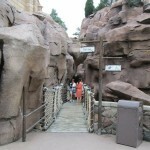 In addition to enjoying our first Disney adventure, I made it my mission to document some of the new amusement park requirements in the 2010 ADA, which meant standing in line a few extra minutes to wait for any accessible seats, photographing complete strangers without their knowledge, and a few other tasks that completely shamed my children. 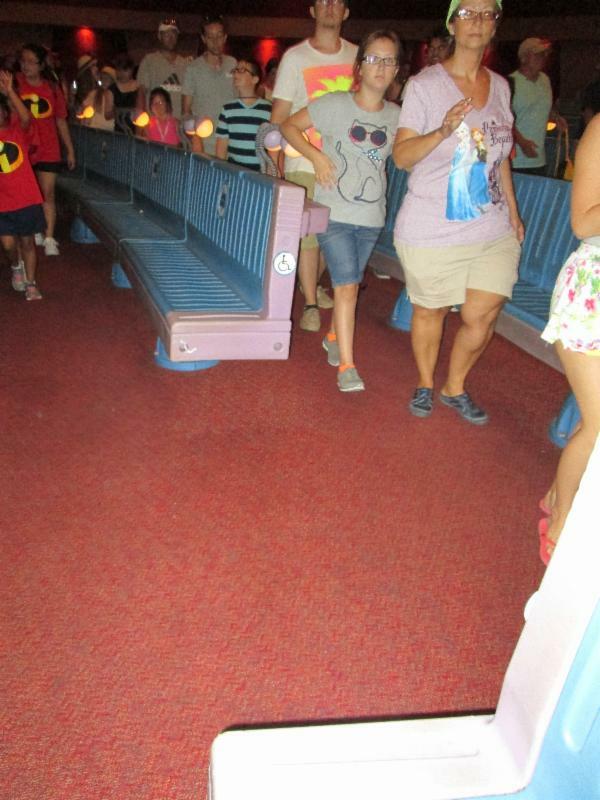 Isn’t that what most parents do when they take their family to the happiest place on earth? 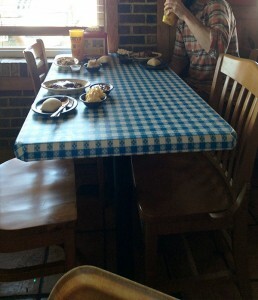 The results of my undercover mission were quite impressive. 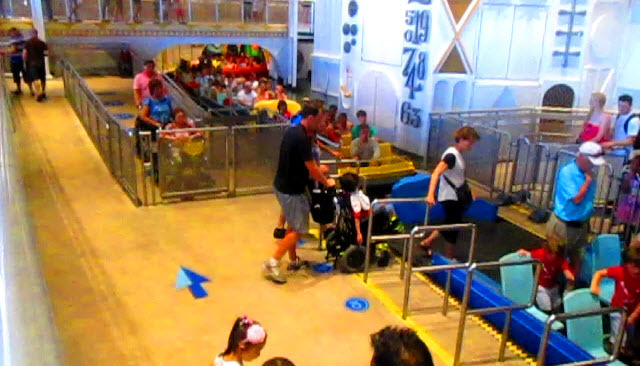 It was truly amazing to me how accessible the entire Disney system was. 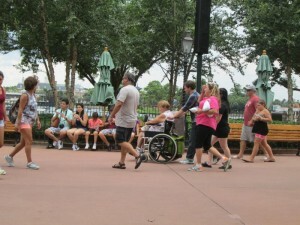 There were so many people using wheelchairs and other mobility aids, not to mention people who had temporary mobility issues and even baby strollers. I was very impressed with Disney for how sensitive and accommodating their parks were for persons with disabilities. 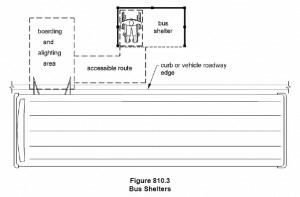 Designated loading areas at every bus stop and on every bus. 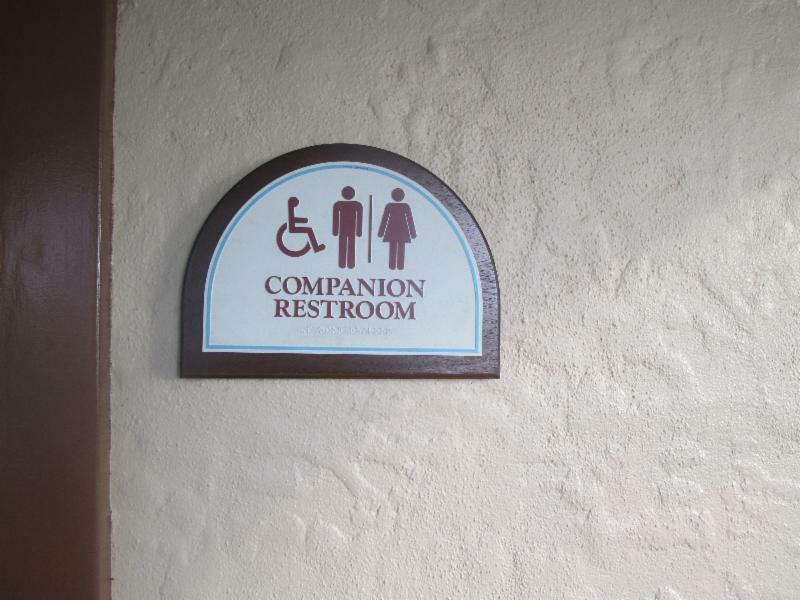 Accessible restrooms throughout every park. 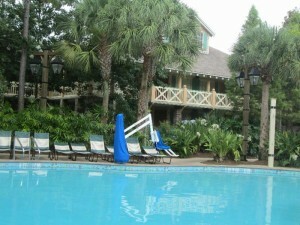 Lifts and other means of entry in the swimming pool areas at each of the resorts. 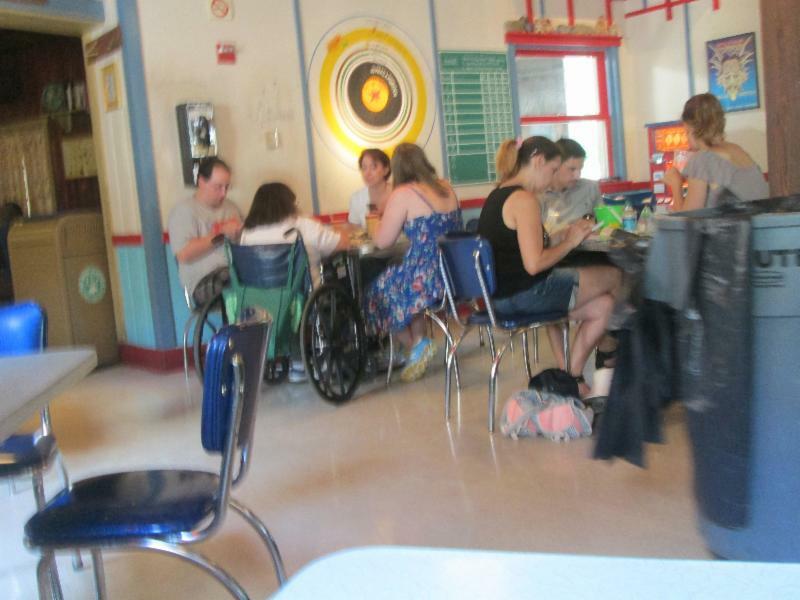 Accessible dining surfaces and seating at the attractions in abundance. 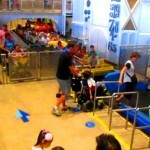 The 2010 ADA devotes an entire section to creating accessible amusement park rides. 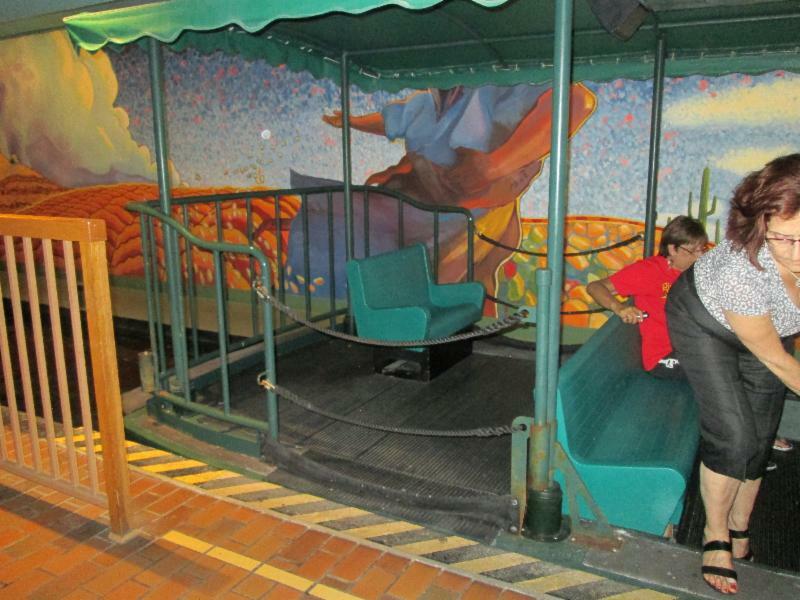 With special spaces designated for people in wheelchairs, companion seats, accessible loading areas and ramps, Disney passed with flying colors. “Applying the ADA” published by Wiley. 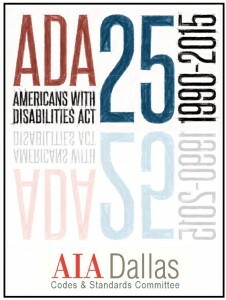 July 26th, 2015 was the 25th anniversary of the ADA. 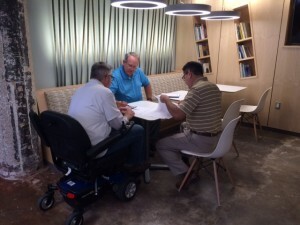 On July 23rd the AIA Dallas organized an awareness day exercise called “Wheelchair in A Day” where we asked 10 architects to sit in a wheelchair and record their experiences throughout the day. The day was a huge success and the stories they retold were so important. This newsletter will give you a few examples of the participants. Thank you to Bob Bullis, AIA; Beth Brandt, AIA; Daivd Dillard, FAIA; Bob Borson, AIA; Peter Darby AIA, Laurel Stone, Amanda Adler, Jason Dugas, AIA for participating and for sharing your experience with the rest of us! 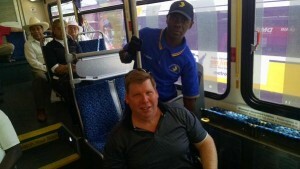 AIA Dallas President Bob Bullis, AIA participated in the “Wheelchair for a Day” event. He had a meeting in Houston which he decided to keep. 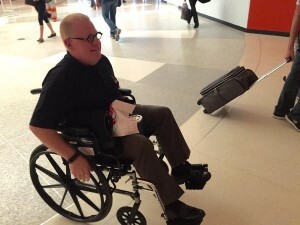 So he flew in his wheelchair and tweeted about his experience. We asked him what was his biggest challenge. 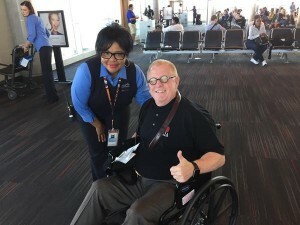 He told us about his trials with TSA….and I will not get into the “search” pat down he received…Southwest Airlines was very accommodating, and allowed him to remain in the chair so he could experience what it was like. 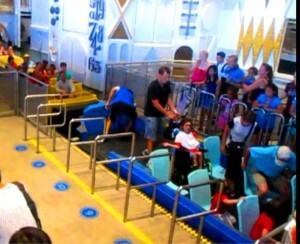 He got to go to the front of the line and board first. 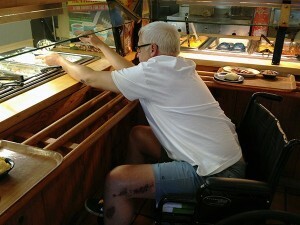 Taking the tray back to his table was a big challenge…glad he didn’t drop his food! 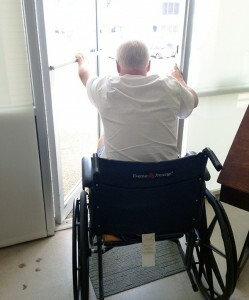 David Dillard, FAIA also stayed in his office and also experienced his daily routine in a wheelchair. 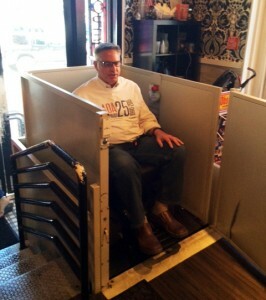 Meetings are easier when you are the designer of the office and make accommodations…Good job David! The City of Dallas didn’t plan properly the locations of stop signs and fire hydrants. David found them right in the middle of his accessible route. I bet those were fun to maneuver. 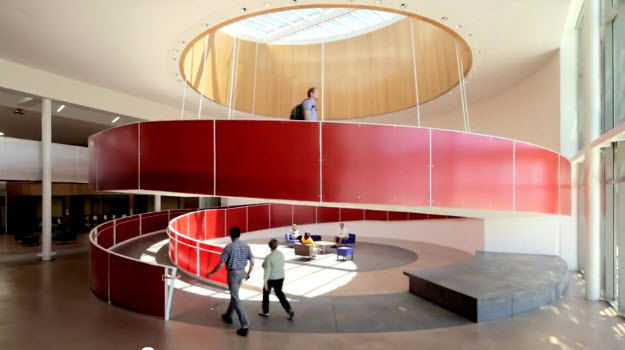 Experiences like these makes architects and designers more sensitive to the people they are designing for. 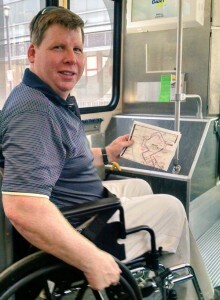 It takes so much longer to get from point A to point B when you are in a wheelchair taking public transportation, but most people with disabilities, especially visually impaired people use public transportation to get around. It is so important that we have these accommodations to enable them to be independent and as sense of dignity and empowerment. My family and I just finished our first family vacation to Disney World! It was amazing to me how accessible it was. 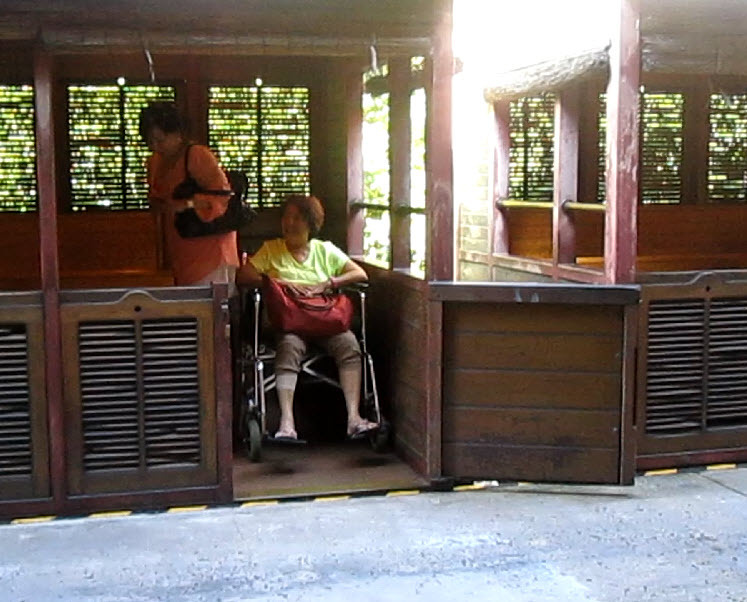 There were so many people using wheelchairs and other mobility aids, not to mention people that had temporary mobility issues and even baby strollers. 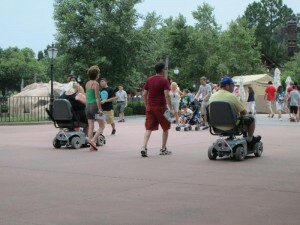 I decided to document some of the new requirements in the 2010 ADA for amusement parks. 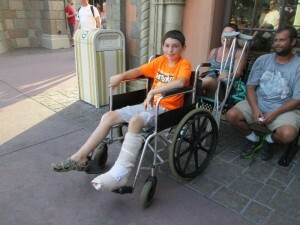 I was very impressed with Disney for how sensitive and accommodating their parks were for persons with disabilities. 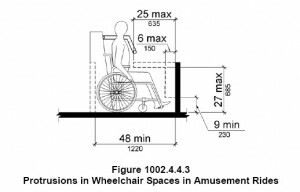 In this newsletter we will discuss the basic requirements that the 2010 ADA Standards require when building a new amusement park or renovating an existing. 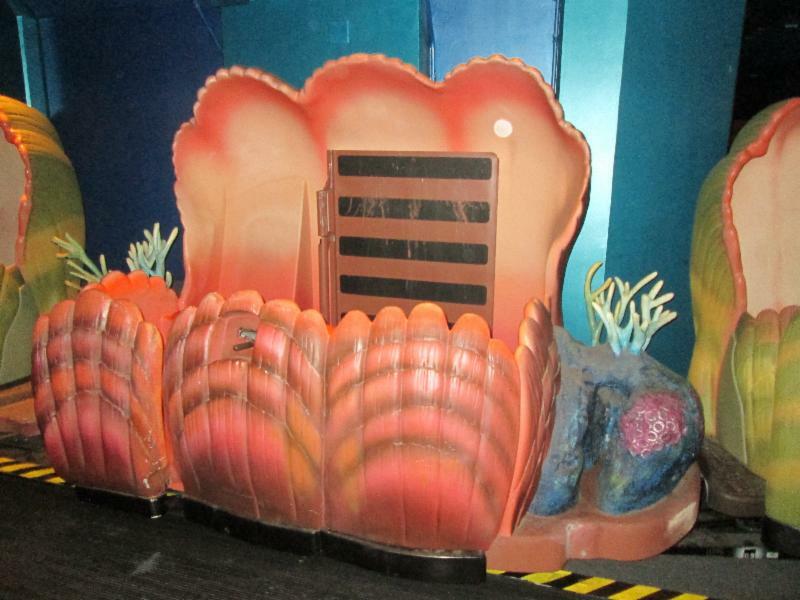 An existing amusement park rides are exempted from having to comply. 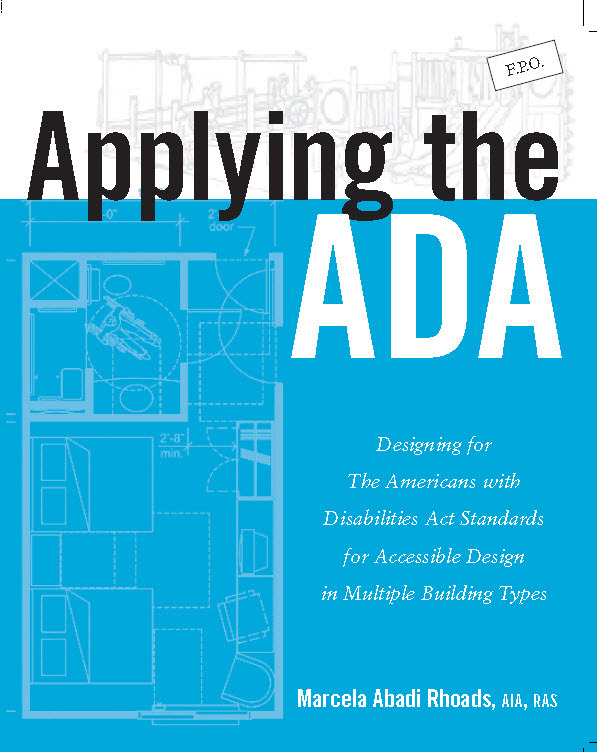 If you want further information, refer to “Applying the ADA” chapter 7 which is an entire chapter on accessible amusement parks. 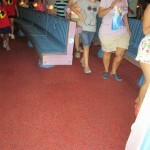 As any public accommodation, an amusement park has common areas that are open to the public which will have to comply. 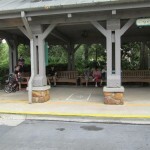 At Disney World, this was achieved beginning with their transportation and throughout the park. 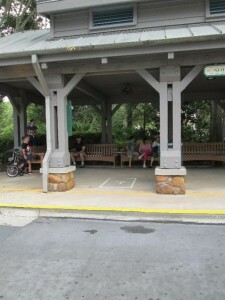 They had accessible bus stops, restrooms, accessible ramps throughout the park as well as accommodation at restaurants and other public areas. 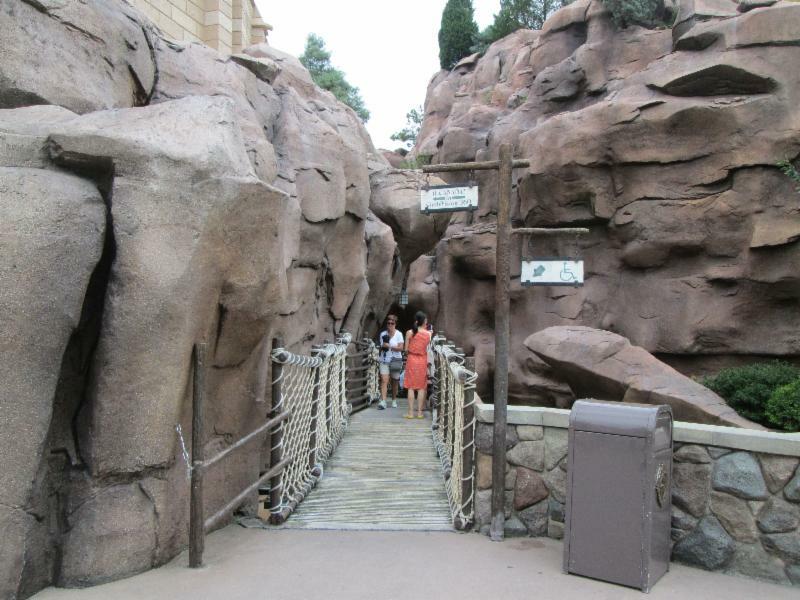 Several of the attractions in Disney World are shows. They also had accessible seating and companion seating available at almost every show. 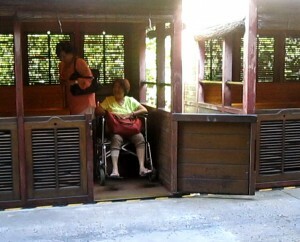 This ride had a space designated for people with wheelchairs. A companion seat was also provided alongside it. 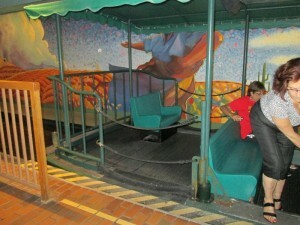 This ride has a ramp that deploys and allows a person in a wheelchair to enter the ride. 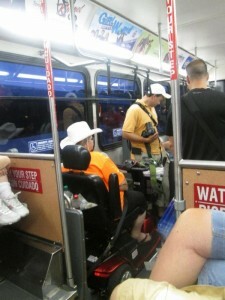 This photo shows the person in a wheelchair in the designated seat for persons with disabilities. – or at least one transfer device complying with 1002.6. Amusement rides that are controlled or operated by the rider shall not be required to comply with 234.3. Amusement rides designed primarily for children, where children are assisted on and off the ride by an adult, shall not be required to comply with 234.3. Amusement rides that do not provide amusement ride seats shall not be required to comply with 234.3. 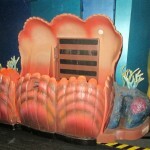 The technical Standards have requirements for the following elements of the amusement rides. 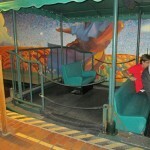 They are very detailed and we encourage you to read up on them if you are designing amusement rides. 1002.3 Load and Unload Areas. 1002.5 Amusement Ride Seats Designed for Transfer. 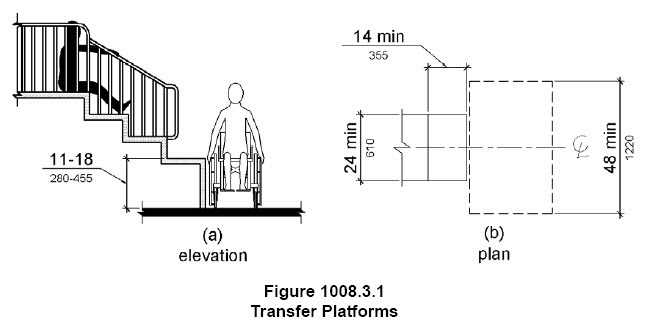 1002.6 Transfer Devices for Use with Amusement Rides. 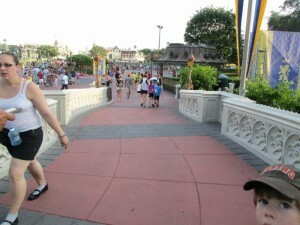 Kudos to Disney World for their commitment to persons with disabilities! We are celebrating our 10th year of service to the building industry as a Registered Accessibility Specialist! Mention this newsletter and receive 10% off your next review or inspection. 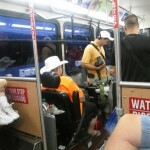 The Americans with Disabilities Act became the civil rights law for disabled Americans in 1990. Ever since then, the disabled community has been able to get jobs, enjoy independence and become productive members of our society. The ADA is organized in five “titles”. 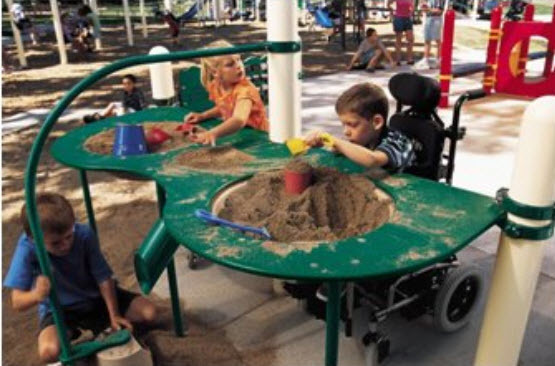 In this post we will focus on the Title III which requires that places of public accommodation and commercial facilities be made accessible to persons with disabilities. We will also touch on Title I which states that a business cannot discriminate against a person with disabilities when they are hiring or firing. They can’t decide not to hire someone or fire someone based on their disability. 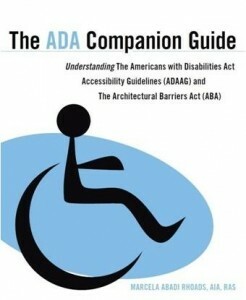 In essence the ADA makes sure that persons with disabilities get treated equally. So how does a building owner and landlord comply? Part of the ADA required that places of public accommodation and commercial facilities be made accessible to persons with disabilities. By this mandate, building owners had to make their buildings, new or existing accessible. This requirement was sometimes more difficult than was first thought. For newly constructed buildings, they had to make sure that their architect and contractor understood the requirements otherwise their building would not be in compliance and there could be a risk of complaints or worse, a law suit. Ultimately it is the building Owner’s responsibility to make sure things comply, therefore hiring architects, interior designer and contractors that understand the rules, is a huge help. 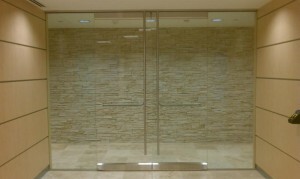 There are different rules for new construction and remodels. The rules for new construction are a bit simpler. Whatever you build must be in compliance. 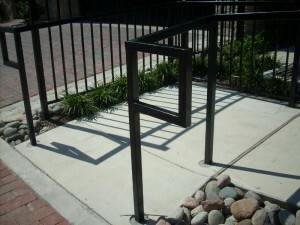 It only gets complicated if the new constructed areas are spaces that are not required to comply. 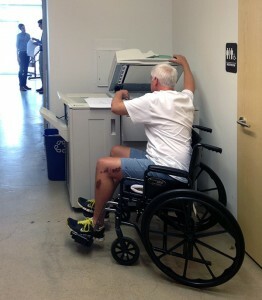 Some examples of areas that do not require accessibility are mechanical rooms, telephone equipment rooms and electrical rooms. These are exempted based on the fact that they are considered “machinery” spaces. Those are spaces that only have equipment inside and only periodically gets monitored by an employee. Another area of confusion during design and building are employee areas. 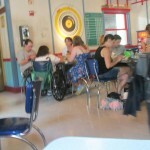 Employee areas are not necessarily excempted from having to comply. I hear a lot of building owners say “nobody will ever go back there” when they speak of employee areas. They are correct in making the statement because customers may not necessarily be allowed to go to an exclusively employee or staff area. But what it is not clear is that their employees and staff will be going “back there” and using the facility. 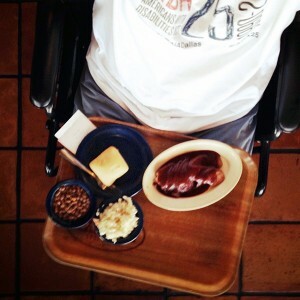 This is where Title III of the ADA gets intermingled with Title I. 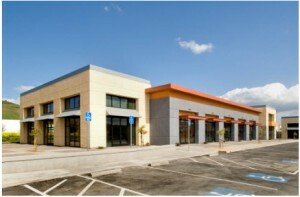 Title III recognizes that not every employee will need the facility to be accessible at the time construction is complete and that the business may not have a disabled person working there. Therefore they are not required to provide accessible “work areas” or areas where the work is happening at the time the project is finished. As soon as a disabled person wants to work there, or if (G-d forbid) an employee becomes disabled while working there, accommodations will have to be provided. 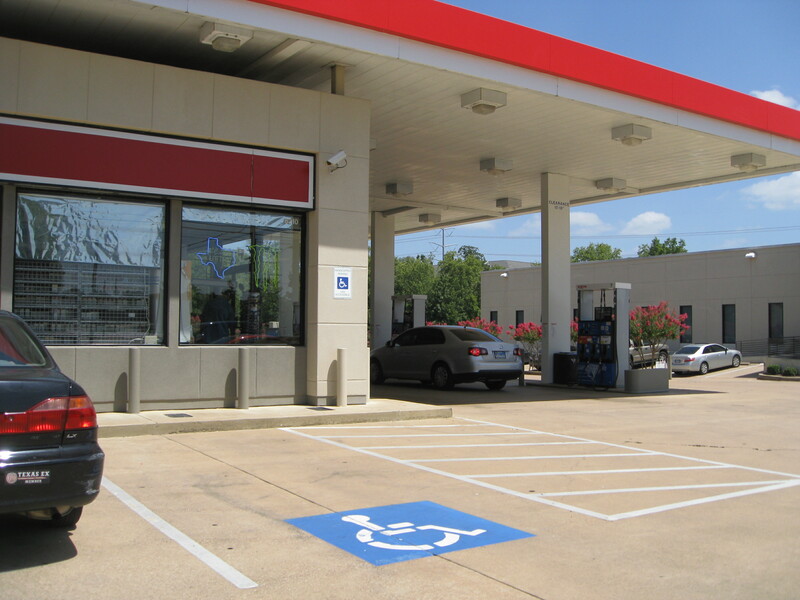 Thus the work areas are exempted from the Title III of the ADA except for the ability to approach the area, enter the area and exit the area. For example, if there is a stock room or a copy room in an office space, those are considered work areas and only require approach, enter and exit. The elements within the space, such as counters and shelving or even sinks, will not be required to comply. But it is not ALL employee areas. This exemption is only allowed to be taken for work areas. 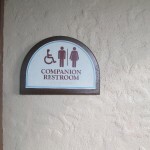 Therefore employee restrooms or employee break rooms are not exempted and must be accessible. The reason is that these spaces are not part of the job description, but rather where they take breaks from work. Private offices that have restrooms inside them, are also exempted for certain elements. The restroom should have the proper clearances, but grab bars, knee space at sinks and knee spaces at sinks will not be required at the onset. The next type of construction is an alteration. 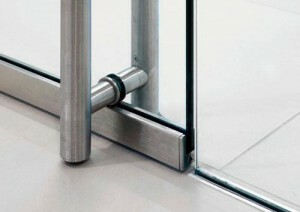 This type of construction is a bit more complicated to decide what is required and what is not. 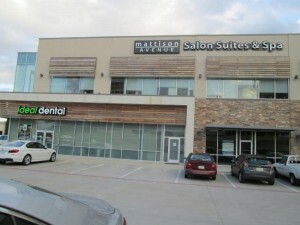 The first thing one has to determine is what area of the building is being remodeled or altered. Does the area contain a primary function of the space? If it does not, such as a restroom or a storage room for example, then only the new elements must comply. So if a new paper towel dispenser in a restroom is getting added, or even if an entire restroom is getting remodeled, only the restroom must comply and nothing else outside the restroom, including the entrance to the restroom. 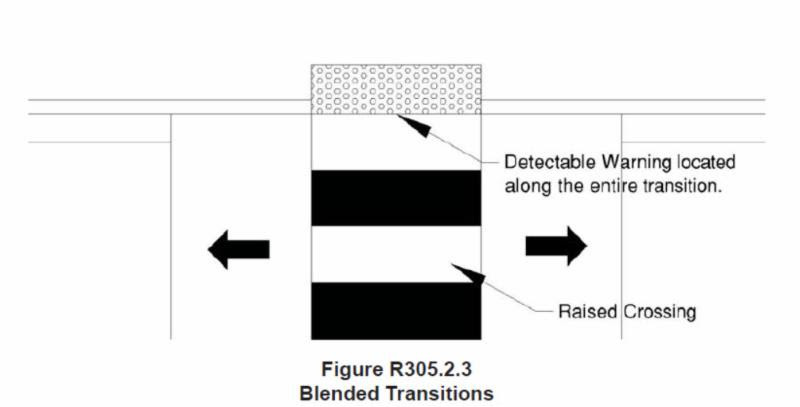 But if the answer is that yes, the area being altered contains a primary function, then the new elements and spaces must comply but in addition to the new elements, existing path of travel from the main entrance of the building must also comply. 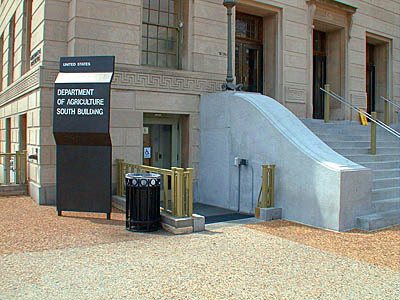 If the existing path of travel contains restrooms, drinking fountains and public telephones, those also must comply with the ADA Standards. 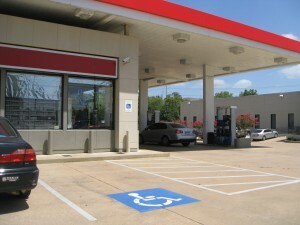 In Texas, the Texas Accessibility Standards added parking to the list. 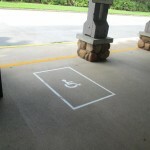 Therefore the parking that serves the altered area must also be in compliance. There is a new exception to this rule of the path of travel. 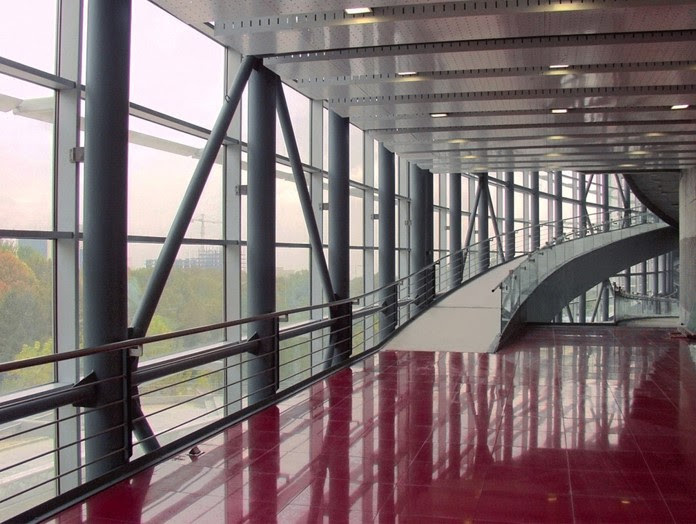 If the building owner is leasing the space to a tenant and the tenant is the one who is paying for the finish out, then the path of travel elements within the building that leads to the tenant space does not have to be brought up to compliance if they don’t already comply. If the landlord pays for any of the tenant finish out via an allowance or any other financial means, then the same rules apply for the alteration of a primary function and the path of travel elements will have to be brought up to compliance. 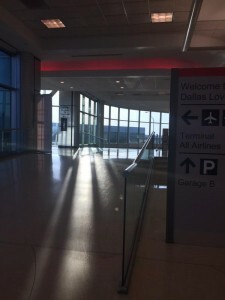 Also, if the facility and the elements along the path of travel comply, but they comply with the old Standards (1991 ADAAG or 1994 TAS), then those are considered a “safe harbor” and also do not have to be brought up to compliance. 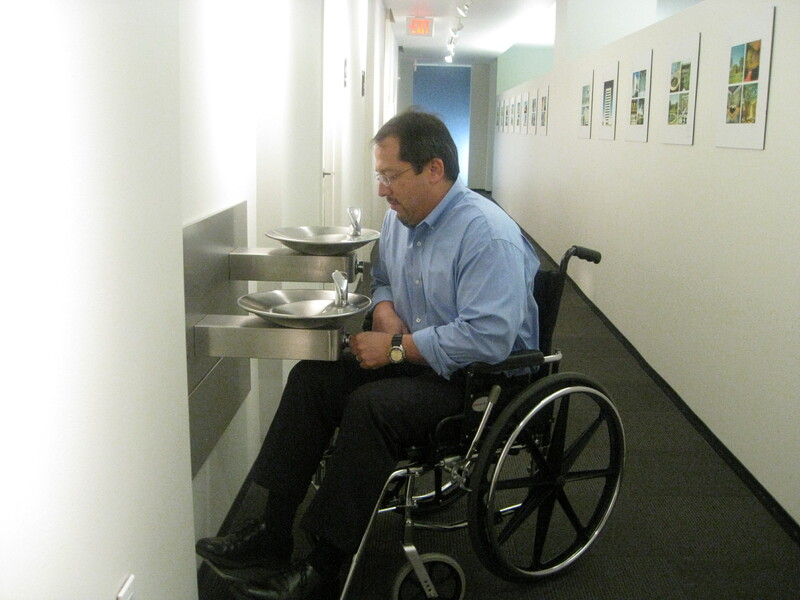 4) Costs associated with relocating an inaccessible drinking fountain. 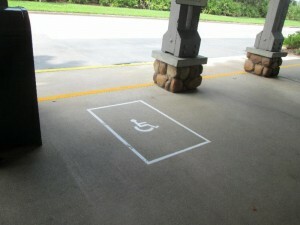 (6) When possible, additional accessible elements such as parking, storage, and alarms. 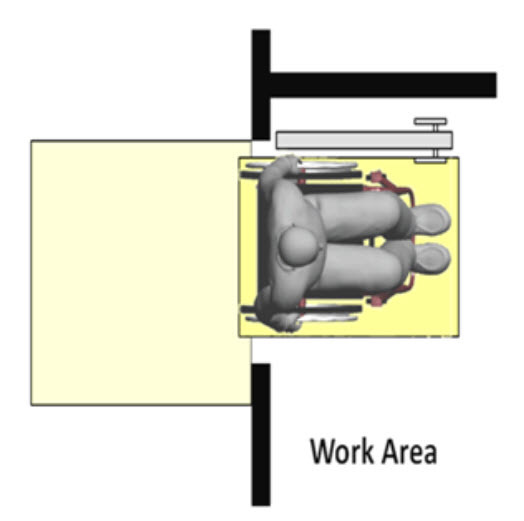 Sometimes the best efforts finds that access cannot be accomplished because existing structural conditions would require removing or altering a load-bearing member that is an essential part of the structural frame or because other existing physical or site constraints prohibit modification. In those cases, speaking to local authorities and the DOJ to get a variance or waiver might be the proper action to take. 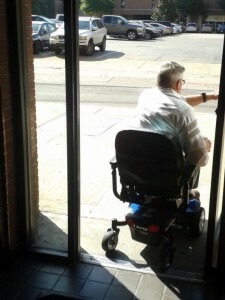 But even if it is not possible to provide access for wheelchair users, the building owner is still required to make sure other disabilities are accommodated. 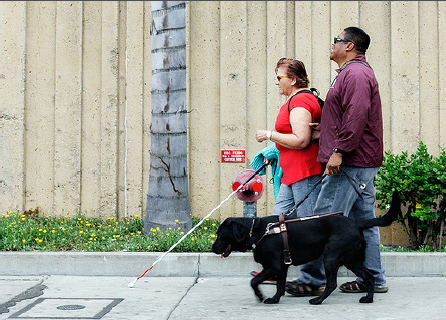 Accommodations in buildings should be provided for the visually impaired, hearing impaired and people with other mobility issues such as walkers, crutches and braces. With all the complicated rules and regulations that we might encounter during the design process, it is important to keep in mind the big picture. What was the reason for all this extra effort? 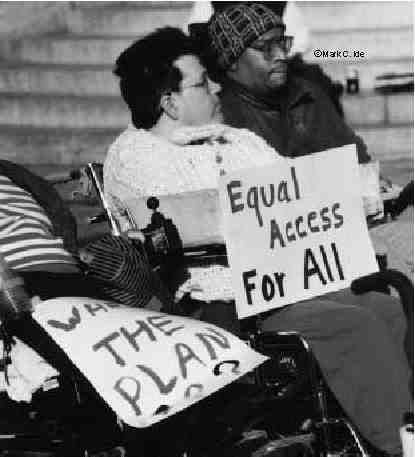 Before the ADA was enacted, a person with disabilities was relegated to stay home or in an institution. 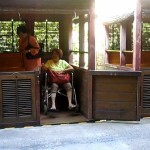 They depended on others for transportation and for every day tasks. The ADA was enacted to encourage and promote the rehabilitation of persons with disabilities, to eliminate unnecessary architectural barriers for persons with disabilities, to not restrict the ability to engage in gainful occupation and to not restrict the ability to achieve maximum personal independence. As building owners we must keep in mind our customers and how at the end of the day we are opening our doors to a large portion of the population that wasn’t thought of before. And the struggle will continue as Americans age and as more of us become disabled. But these guidelines are universal. When we remove barriers for one group, we are essentially removing barriers for everyone. 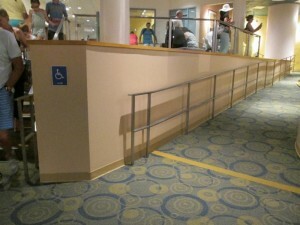 And the more architectural barriers we remove, the more cultural and social barriers we remove as well.